The Candlelight Processional Dinner Package: Is It Worth It? The Disney holiday season is already in full swing at the Disney parks and Candlelight Processional at Epcot is one of my favorite holiday events. Each night, a celebrity narrator tells the traditional Christmas story, accompanied by a full orchestra and choir. You will have the chance to watch, listen, and sing along with some of your favorite Christmas and holiday tunes. If you plan to visit Epcot this holiday season, this is a show that the entire family will enjoy. The show is free with park admission, but since this is a very popular event, you will need to plan ahead. 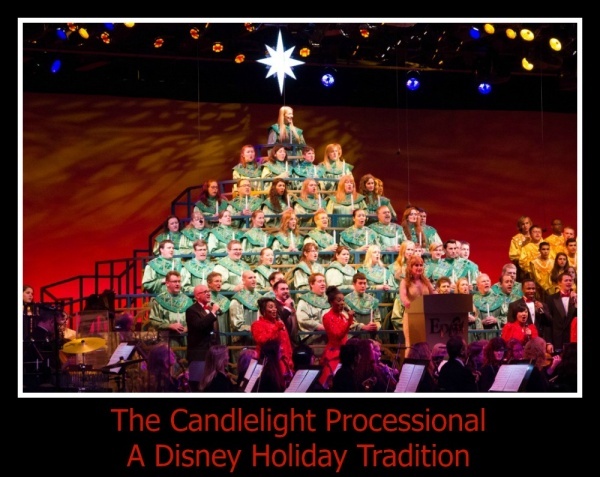 Seating is available on a first-come, first-served basis (a line often forms hours before the performance) or you can purchase the Candlelight Processional Dinner Package if you want to ensure that you will have a seat for the show. What is the Dinner Package? Think of the Candlelight Processional Dinner Package as “Dinner and a Movie/Show” or purchasing dinner and receiving a FastPass to return for the show. You will choose from one of the many participating Epcot restaurants (list below) and make a reservation through the My Disney Experience website or by phone. 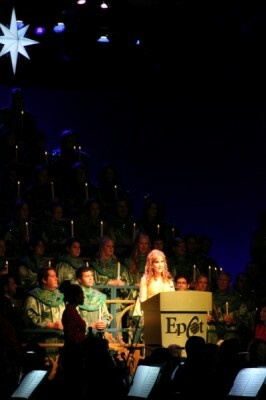 You will need to specifically choose the “Candlelight Processional Dinner Package” when making the reservation. 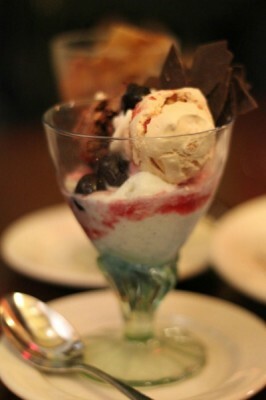 Each meal includes an appetizer, entree, dessert, and drink (non-alcoholic) at a pre-set price. If you have not yet made a reservation for this year, there are still some seats available. The more flexible on the date and time that you wish to attend the show, the better chance you have making the Candlelight Processional Dinner Package a reality. One thing that you should be aware when you arrive to obtain your Candlelight Processional seat of is that there is a separate line for those with dining package reservations. Make sure you are standing in the correct line and not the standby line. There are three Candlelight Processional performances each night at 5:00 pm, 6:45 pm, and 8:15 pm. The narrators change every few days. Is each show the same? Yes and no. The story and the music do not change from show to show. The narrator changes every few days. The choir singers are comprised of both cast members and high schools who come from all over the country to perform, so the performers change but you are unlikely to notice this (unless you happen to know a family member or friend who is performing). The biggest difference is how dark it will be for the show. It is not quite dark at the start of the 5:45 performance, especially on the earliest show dates. If you want it to be dark so that you can see the full effect of the candles, you will need to choose a later show. These seats, of course, are the fastest to fill up. So, is it worth it? With an average price of $50-$60 per person, the cost can add up quickly for a family. If you are on a tight budget, this may be one expense you don’t care to add to your vacation. The benefit, however, is that there is no need to stress over getting a seat. The Dinner Package ensures that you will have a seat at your designated show. Weekend shows and shows with more popular narrators (think: Neil Patrick Harris) often draw larger crowds than some of the weeknight shows. 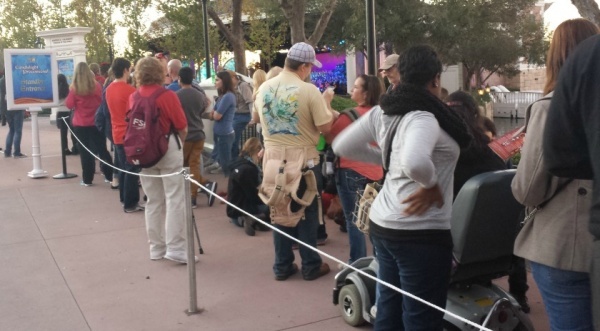 If you are willing to wait in line for several hours before the show, this may not be a problem, but if you wish to spend your time visiting the other attractions, spending a chunk of your day waiting around is not ideal. The Dinner Package allows you to relax and enjoy a nice meal with your travel companions. After a day full of rides and attractions, it is nice to sit back, relax and watch the hustle and bustle go by rather than being caught up in it. The Dinner Package can make a really nice gift! I speak from experience on this one. I booked the Candlelight Processional Dinner Package last year as a Christmas gift for my mother (a singer, music teacher, and choir director). She loved it so much that she requested another trip this year. I was more than happy to agree. Just like that, it has become a mother/daughter tradition! If you know you will be back at Epcot soon and don’t mind the wait, save the money and take your chances in the stand-by line. Soarin’ and Test Track will still be there on your next visit. If you are willing to stand, there is also a limited amount of standing space behind the seating as well. If this is a special occasion or a once-in-a-lifetime trip, go ahead and splurge! It will be a really enjoyable holiday experience! Can’t make it to Epcot this holiday season? 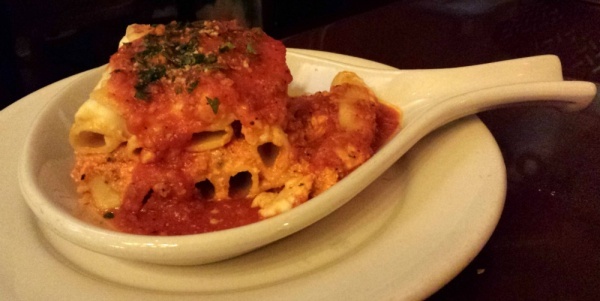 Like most other restaurant reservations, you are able to reserve up to 180 days in advance. If you want to have first choice of restaurants and show times, you will need to remember to book in early July. The earlier you book, the better. If you are like me, the holidays will be the last thing on your mind while you are laying by the pool or building sand castles on the beach, so mark your calendars now! I already have an alarm set on my phone to remind me. I’ll do my best to remind you too! I hope that you all have a wonderful and joyous holiday season! Have you tried the Candlelight Processional Dinner Package? What did you think? We just returned from Disney and attended the Candlelight Processional using the Dinner Package. The program and the food were great. However when we asked where to go for he reserved space for the firework show we were told they don’t do that anymore. Thanks for the heads up on the Illuminatons information!